MARQUETTE, Mich. - The jagged, granite outcroppings that can be seen from many holes at Greywalls at Marquette Golf Club aren't just eye candy. Chances are, your golf ball is going to clank off at least one of these walls during your round at Greywalls, one of the most talked about golf courses in Michigan in recent years. 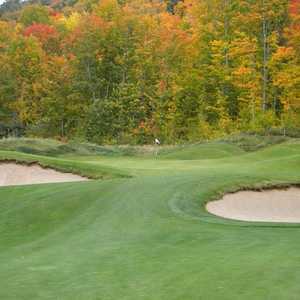 The Greywalls golf course is set on rocky terrain in Michigan's Upper Peninsula. Michigan native Mike Devries, a former intern under Tom Doak and groundskeeper at Alister Mackenzie's Crystal Downs Country Club in the lower peninsula just off Lake Michigan, takes natural, minimalist golf course design to the next level here. The result is a course with tumbling, rugged fairways with few flat lies, some awkward-looking shots and rugged rough and bunkering. In fact, Greywalls smacks you in the face, somewhat unexpectedly. When you arrive at Marquette Golf Club, you see an understated, old golf shop and a golf course that looks mostly flat and traditional. The club dates back to 1929, and the flatter, original Heritage Course is still in play today. So no, you didn't pull into the wrong golf course. To reach the new Greywalls, just head over the hill beyond the clubhouse, and suddenly you're on an entirely different planet, where you're playing on steep hillside set high above Lake Superior, visible from many of the course's highest tee boxes. "This is not a pasture-flat golf course," the 13-handicap wrote. "The course has the Scottish roll to it but with many outcroppings on the sides and in some fairways. If you stay in the tight, well-groomed fairways, the rewards are great." No. 1 is a 578-yard par 5 that from the tee presents a good taste of things to come: tumbling fairways that make it difficult to identify the right landing zone, steep drops off fairways and large, steep-lipped bunkers. The fairway weaves up and down, so if you hit your second into a dip, you'll be well below the green for your third shot - enough so you won't even be able to see the pin. On the second hole you can use the ground game to your advantage, as a steep slope left of the green will funnel balls onto the putting surface, while trouble lurks short and right of the green, promoting the ground option. 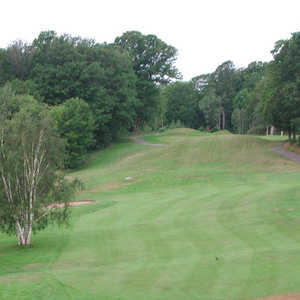 This course is reminiscent of the British Isles, especially if you've ever played a heathland high up off the sea that features steep slopes and firm fairways. Greywalls also uses traditional fescue fairways. No. 16 demands you land your approach shot short and right, as the very large green has a gentle front-to-back slope. Even with a short iron in, you'll risk losing your ball over the green. And despite starting out with some of the course's most penal holes, Greywalls gives you a couple chances to get some shots back on the two closers. No. 17 is a tame, 137-yard par 3 where the only real defense of the hole is a shallow, wide green. The 18th is a long par 5 that plays from an elevated tee looking over Lake Superior straight downhill to a wide, bowled fairway. The approach is wide open, too, with a large fairway and no trouble around the green. Going for it in two is a no-brainer. Poorer players are going to be intimidated at Greywalls, especially if they play from a tee set they're not comfortable with or there's a lot of wind coming off the lake. That said, this is a course worth experiencing because it's simply one of a kind, thanks to Devries' imaginative-yet-minimalist design set on striking terrain. "A monkey on a barstool course," noted Michigan photographer Nile Young on a tour around the golf course, a photographer's phrase meaning just about anyone could get some good pictures out here thanks to the dramatic setting. Greywalls is a par-71 and 6,828 yards from the championship tees, though there are five sets of tees, playing as short as 4,577 yards. Green fees are $125 but can be booked far cheaper through the Island Resort and Casino "Perfect 4-some" golf package, which also includes Sweetgrass Golf Club and Timberstone Golf Course. The resort is located about an hour south of Marquette near the shores of Lake Michigan and boasts newly renovated guest rooms and a full, Vegas-style casino.